Over the past 14 years I’ve accumulated a ridiculous number of digital photos and files, the disappearance or corruption of which would likely be a serious blow to my mental health. Since switching to a Mac I’ve felt secure in the knowledge that Time Machine is watching my back, all I have to do is remember to plug in my trusty Drobo and let OS-X do its stuff. But then the Drobo started behaving erratically, often not backup up more than a few kb over a weekend. Uh-oh: been backing up over crappy WiFi again? What’s happened here is that some kind of discrepancy has arisen between the data that’s been backed up and the data that’s on my machine, leaving me with two choices: don’t back up any more, or start a new backup and lose all backup history up to this point. Now I don’t really care about backup history. The main reason I do this is so that I have a complete, up to date copy of all my stuff in the event that my laptop gets stolen or my Thunderbolt disk catches fire – historical version data is a nice-to-have but by no means essential. So why is starting again with a fresh backup such a big deal? Because even over gigabit ethernet it takes around two days to do one, ask me how I know. 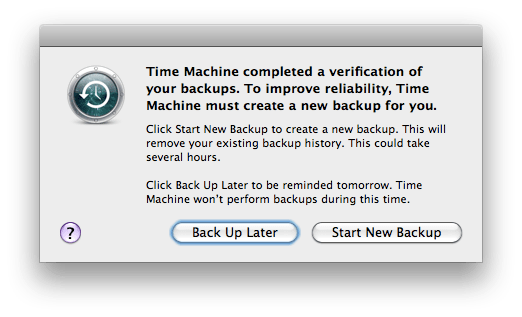 Once you’ve completed the above steps you should be able to run a Time Machine backup as before, though if you want to set your mind at ease you can always verify the backup first by clicking the Time Machine icon in your menu bar while holding ALT. One thing worth noting is the amount of time it takes to rattle through the steps on Garth’s blog. I would have expected these to take much longer than they did, given the length of time it takes to do a full backup. Yet the changing of flags in step #1 was by far the longest part of the process at around 35 minutes.